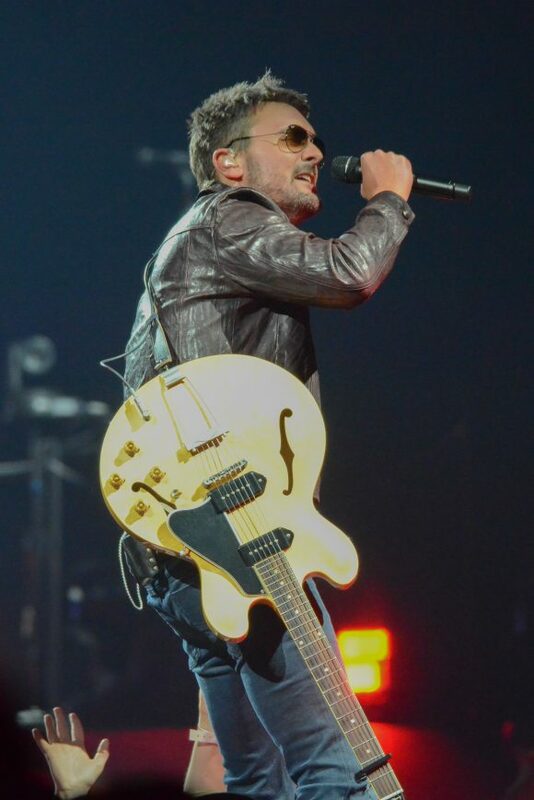 Eric Church has been pushing the edge of country music for sometime now. This years Double Down tour is no exception, scheduling two night in most cities with two unique set lists in each city no two shows are the same. Friday nights show the energy throughout the whole arena was high as fans filled up the seats. Church started the show on Friday night with the song “That’s Damn Rock & Roll” and was accompanied by backup singing Joanna Cotten who made multiple appearances throughout the night. Church welcomed the arena to the first night of the double down Chicago tour stop and talked about how his first time in Chicago performing was at Joe’s on Weed and he was very excited to be back. Energy was high and the band was rockin’ during the night, they played songs from his new album “Desperate Man” and also played songs from past albums like “Chief”. Eric was active with the crowd and took the time to sign fans records that they had brought to the show and were holding up. A fan favorite, “ These Boots” was performed later in the night and the crowd all began to hold up their cowboy boots and I even saw people holding up their gym shoes during the song. As a Chicago based photographer I have gotten to meet and see a lot of great shows over the years. Now I get to share them with you!